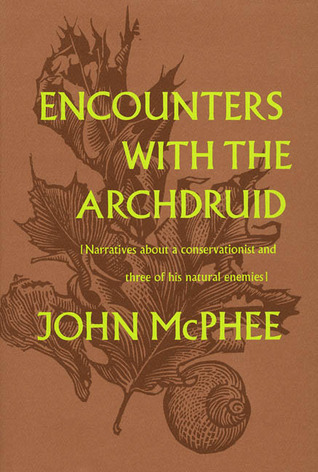 Despite being a decades-long John McPhee fan, I had never read his 1971 book Encounters with the Archdruid. A year or two ago, when I saw that Joel had put it on his Amazon wish list, I bought it for him, this being an indirect way to buy it for myself as well, since we share a Kindle account. I didn’t touch the book for a while. It was Joel’s after all. But I eventually downloaded it and read a few pages here and there, continuing to wait for Joel to read it first before plunging in. Finally, a couple of weeks ago, plunge in I did. What a marvelous book. It’s three independent pieces, each featuring an encounter between environmentalist David Brower and someone whose work places him in opposition to Brower’s principles. First we meet a famed geologist at Stanford who advises mining companies. McPhee sets up a trip to Glacier Peak National Forest here in the Cascades, accompanying the two as they hike through the mountains argue over developing a copper mine. Next McPhee brings Brower together with the man who developed Hilton Head Island as they visit Cumberland Island, off the coast where Georgia meets Florida. Cumberland is in private hands and undeveloped, but development is on the way. Or perhaps a takeover by the federal government, which can convert it to national seashore. The third encounter, between Brower and the nation’s great dam builder, fresh off his completion of the Glen Canyon Dam, has the pair ride down the Colorado and debate future dams in the Grand Canyon. The secret to the book is that each of Brower’s foes is entirely likable, a delightful character whom one finds oneself rooting for. I could quote countless passages to illustrate this, but I’d end up quoting the book as a whole. Here’s one I marked in which Dominy, the dam builder, recounts a trip with Robert Frost. A year ago, Adam Hochschild wrote a piece about McPhee that explains the book’s greatness far better than I can. I’ll outsource the rest of the post to Hochschild. To my mind, McPhee’s engineering masterpiece is his Encounters with the Archdruid, the text of which, like almost all of his books, first appeared in The New Yorker. A portrait of the environmental activist David Brower (1912-2000), it is structured like no other biography or profile you will read. Brower was a militant, not a compromiser or deal-maker, and his passionate, lifelong defense of the American wilderness against any threat dependably left his enemies fuming. And so the book is arranged around three prolonged encounters between the “evangelical” Brower, as McPhee calls him, and people who detest everything he stands for. The first is a prominent mining geologist named Charles Park, whose entire life has been devoted to targeting deposits of valuable minerals, wherever they are found. He was a man who believed, McPhee says, “that if copper were to be found under the White House, the White House should be moved.” How does McPhee bring him together with Brower? He takes the two of them camping and hiking for a week or so in the Glacier Peak Wilderness in Washington State. The setting is shrewdly chosen: Glacier Peak is a federal wilderness area, “not to receive even the use given a national park, not to be entered by a machine of any kind except in extreme emergency, not to be developed or lumbered – forevermore.” But there’s a key exception: mining claims, including a huge one held by Kennecott Copper, remain valid, and, at the time the men were making this trip, for more than a dozen years into the future new claims could still be made. To display two political enemies in combat, McPhee could not have picked a better battleground. Park chips away at rocks with his geologist’s tools, curious about what metals could be mined here to feed the American economy; Brower praises the beauty of the mountains, still unravaged by men like Park. Almost any writer, doing a story like this, would have elicited these rival points of view by interviewing the two men separately. McPhee, however, brings them together, where, with spectacular scenery in the background, they argue at length, providing him with writer’s gold: dialogue. The second encounter McPhee sets up, again for what appears to be a week or so, is between Brower and a businessman who wants to build a vast housing development on a wild island off the coast of Georgia, complete with an airport suitable for private jets. Compared to the first encounter, the conversation between the two antagonists is much more polite. However, the businessman, Charles Fraser, has great contempt for environmentalists, calling them “druids.” He tells Brower, “I call anyone a druid who prefers trees to people” – hence the book’s title. The outermost circle of the Devil’s world seems to be a moat filled mainly with DDT. Next to it is a moat of burning gasoline. Within that is a ring of pinheads each covered with a million people – and so on past phalanxed bulldozers and bicuspid chain saws into the absolute epicenter of Hell on earth, where stands a dam. Conservationists who can hold themselves in reasonable check before new oil spills and fresh megalopolises mysteriously go insane at even the thought of a dam. … possibly the reaction to dams is so violent because rivers are the ultimate metaphors of existence, and dams destroy rivers. David Brower regarded the building of the Glen Canyon Dam, upstream on the Colorado River from the Grand Canyon, as “the greatest failure of his life,” McPhee says. But after losing that battle, he went on to furiously wage and win several others, stopping Bureau of Reclamation plans to build two more large dams in parts of the Grand Canyon itself. His arch-enemy in this prolonged warfare, the proud builder of the Glen Canyon Dam, defeated for the moment in the later struggles, was Floyd Dominy, longtime commissioner of the Bureau of Reclamation, in effect chief dam-builder for the U.S. government.